Little things can make all the difference! 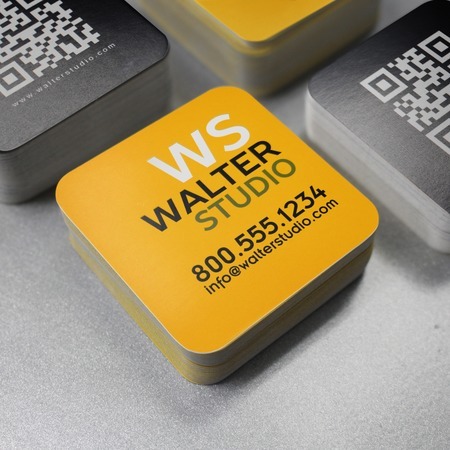 Business cards that are square with rounded corners show off your creative style. It’s a favorite design of creative professionals who want to promote their services while showcasing their work in a unique way. With square rounded corner business cards, you have the chance to make a great long-lasting impression with potential customers and business partners. This shape is a hit with creative professionals and businesses including graphic designers, design studios, and artists. Personalize your square cards to reflect your own unique style with UPrinting’s easy design tool. With it you can create your business card layout without a hitch. Print from 25 to 10,000 cards with a 2, 4, or 6 business-day print turnaround.